(Honolulu, HI, December 10, 2013). Jason Scott Lee, star of 25 motion pictures and raised in Hawai‘i, has lent his voice to a new public service announcement aimed at helping to save the highly endangered Palila (Loxioides bailleui). 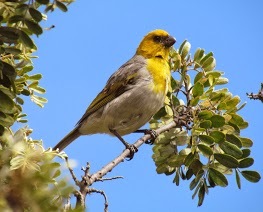 This bird is found only in a small patch of mamane forest on Mauna Kea volcano on Hawai‘i Island. The Hawai‘i Department of Land and Natural Resource’s Division of Forestry and Wildlife (DOFAW) and American Bird Conservancy (ABC) have initiated a new outreach campaign that features the PSA which began airing statewide this week, and which will also be available soon for viewing at: RestoreMaunaKea.org. Lee is the voice of the Palila in this brief overview describing the causes for the bird’s declining population and management efforts to help save it. In January 2014, a 9 x 12-foot mural featuring Palila and mamane will be completed for display on a prominent building in downtown Hilo, the county seat and largest city on the island. The Palila has been loved by Hawaiians since ancient times and, along with other native species, they formed the environment that influenced the formation of a unique culture. Queen Emma visited Mauna Kea in the early 1880s, and a series of mele (chants) commemorate the event, including one describing the memorable song of Palila (from Nogelmeier 2001, He Lei no Emalani: Chants for Queen Emma Kaleleonalani). “E aha ana lâ ‘Emalani – “What is Emmalani doing there? I ka wai kapu a Lilinoe – At the sacred water of Lilinoe? The population of the Palila, a Hawaiian honeycreeper, has declined 66 percent in the past decade, with fewer than 2,200 birds currently left. The Palila’s downward population slide is a result of habitat degradation, predation, and severe drought conditions that are causing reductions in food supply. The native mamane and naio forests upon which the Palila depends have been degraded by non-native feral sheep, goats, cattle, and hybrid mouflon sheep over the past 200 years. The Palila once lived across most of the Island of Hawai‘i, but its range has shrunk to roughly 5 percent of its historical size. Other threats include long-term drought influenced by climate change, non-native, feral cats and mongooses that prey on adults and nestlings, fire, and invasive non-native plants. In a series of court orders beginning in 1979, the U.S. District Court for the District of Hawai‘i ruled that to prevent the bird’s extinction, the Department of Land and Natural Resources must permanently remove non-native ungulates (grazing mammals) from the Palila’s designated Critical Habitat on Mauna Kea through all necessary means, including fencing and aerial hunts. “The Department of Land and Natural Resources is committed to protecting and conserving Hawai‘i’s unique natural, cultural and historic resources which are held in public trust for current and future generations of the people of Hawai‘i nei. We hope our children’s children will be able to know the soothing song of the Palila,” said William Aila, DLNR Chairperson. DOFAW, with critical support from the U.S. Fish and Wildlife Service, is replacing the fence that encircles the majority of Palila critical habitat on Mauna Kea to prevent sheep and goats on adjacent lands from entering protected areas, while also removing the non-native ungulates from within the fence that destroy the native forests. In addition, DOFAW, the Mauna Kea Forest Restoration Project, ABC, and hundreds of local volunteers are restoring and replanting Mauna Kea’s mamane forest, which Palila depend upon for about 90% of their diet. The State of Hawai‘i’s Department of Land and Natural Resources, Division of Forestry and Wildlife is responsible for the management of state-owned forests, natural areas, public hunting areas, and plant and wildlife sanctuaries. Program areas cover watershed protection; native resources protection, including unique ecosystems and endangered species of plants and wildlife; outdoor recreation; and commercial forestry. Visit us at http://dlnr.hawaii.gov/ and on Facebook. American Bird Conservancy (ABC) is a 501(c)(3) not-for-profit membership organization whose mission is to conserve native birds and their habitats throughout the Americas. ABC acts by safeguarding the rarest species, conserving and restoring habitats, and reducing threats, while building capacity in the bird conservation movement. Visit us at www.abcbirds.org and on Facebook.